When I decided to go vegan and gluten free, my family was incredibly supportive. It didn’t take them long to see how much better I felt, and how much happier I was. It wasn’t much of a hard sell. But, my son especially, said, “does this mean no more pizza? ever?” Well, that just couldn’t happen, now, could it? So, I set out in search of a suitable vegan, gluten free pizza. Thankfully, if you google that term, you wind up at the Book of Yum – a great blog filled with recipes I have on my “to try” list. First up, of course, was her pizza recipe. This is actually the second time I’ve made it. The first time, my husband thought we should try some soy mozzarella. Meh. That was okay, but tasted a bit too artificial for my tastes. This time we went with a lovely cashew version of her ricotta “cheese.” I won’t repeat the recipe here, as it’s basically exactly how she wrote it, subbing cashews for pine nuts. I did soak the cashews for several hours before grinding them. I find that soaking them produces a creamier end product. The crust recipe I tweaked a bit. I didn’t want to make quite so much this time. So, I cut the recipe in half, reduced the xanthan gum to 2 t. and left out the Italian herbs. Unfortunately, this isn’t a recipe that reduces all that well, and I ended up adding back in more garfava flour and some corn flour. I didn’t measure the amount I added in, but I’d estimate it to be about another 1/4 cup of garfava and a 1/4 cup of corn flour (used when “kneading” the dough). I also used warm water, skipped the refrigeration, and rolled and topped it without a wait time. I did allow the dough to rise on a warm counter for about 60 minutes prior to rolling it out. 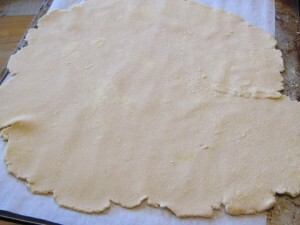 I rolled out my dough directly on a flour-dusted counter top, and then used the rolling pin to move the dough to a piece of parchment on a cookie sheet. Oops, it cracked a little bit. No big deal, though. It’s going to be covered in sauce anyway, right? 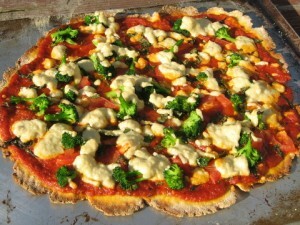 I topped the crust with my home made tomato sauce recipe. Crush garlic and lightly saute with olive oil. Add wine and briefly simmer. Transfer to a blender and puree with tomatoes. Return mixture to saucepan. Add herbs and pesto and simmer until reduced by half. Then, I sprinkled on some chopped basil, some steamed broccoli, and some chopped tomatoes, and dolloped on the cashew cream. The whole lot went into a 500° oven for about 10 minutes. Voila! The kiddo pronounced it delicious, as did the husband. Yay! This entry was posted in Italian, vegan. Bookmark the permalink.